This article describes how to prevent a Specified Microsoft Exchange Receive Connector from being subjected to the AntiSpam Filtering features within Exchange's Hub Transport settings. 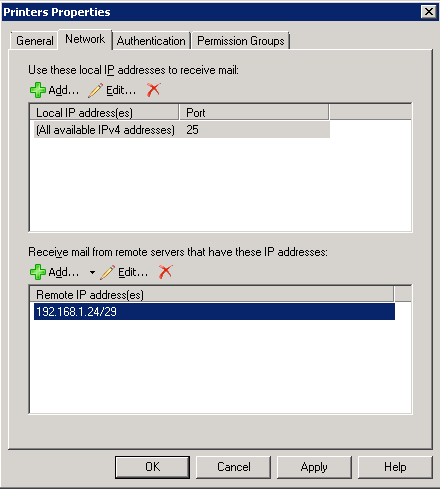 This can be useful for allowing devices (such as printers) on the network to relay emails through your Exchange server using an Anonymous Authenticated Connection (see my other article Configuring Outgoing Mail Server SMTP Settings for Samsung Printers using the SyncThru HTTP Interface) as this often results in Exchange detecting the relay request as possible spam. 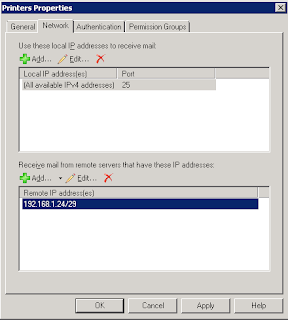 If you are having trouble configuring a network device to use your Microsoft Exchange Server to relay SMTP (email) messages, it is worth turning on the logging facility for the Receive Connector that you have set up. Open up the Exchange Management Console, and browse to Microsoft Exchange > Server Configuration > Hub Transport. You should then see a list of your Receive connectors. Ensure you have an appropriate Receive Connector set up (see screen shots below) and temporarily set the Protocol Logging Level to Verbose on the General tab to diagnose any email test failures you encounter during network device set up. Ensure your Network Device's IP is listed within the Remote IP address section on the Network Tab (In my example below I have a small IP address range defined as 192.168.1.24/29 that covers my Printer IP's 192.168.1.25 to 192.168.1.30 [See IP Calculator]). Check the Anonymous and Exchange Users check boxes to allow anonymous and Exchange authenticated connections to relay. After applying these settings, and testing my Samsung Printer's SMTP Settings, the printer was unable to confirm the SMTP settings were working. The Message Rejected as spam by Content Filtering indicates that the Exchange Server decided the message was spam. .After running this command, your should now be able to relay email anonymously from a network device that has an IP address specified within the Receive Connector.